Mommy Gossip: Did You Make a Difference at #Blissdom09? Did You Make a Difference at #Blissdom09? To my amazing followers who think I've dropped off the face of the earth, I have been over at Mom It Forward for the past 4 months, creating—in tandem with Carissa Rogers and a wonderful group of women (too many to mention)—an amazing community called Mom It Forward. Instead of catching you up on 4 months of Jyl history, let me get you current, starting with now! Now it's Tuesday! I'm home where my southern drawl has been replaced by withdrawal—withdrawal from a weekend rollercoaster ride of nothing but happy, meaningful emotions! What Did I Learn at Blissdom? I learned that happiness abounds. It abounds in spite of having to leave the comfort zones we are all so accustomed to. It abounds regardless of age, social media endeavor, or how closely you resemble your avatar. It abounds in spite of a struggling economy. It abounds for apprentices and mavens. And, it abounds plentifully at that! Showed genuine interest in meeting me or getting to know me even when you may have never heard of me prior to this weekend (don't have enough room here to shout out to the entire conference, but know I appreciate you!). Your smiles and hugs and squeals and genuine love are now a part of me! Roomed with me (Carissa Rogers, Sugar Jones, Rachel Ferruci, Jessica Smith). Made me blush when you said you were "crushing on me" ;) (Pensieve Robin). Told me you loved my wild eye shadow (Arianne and Alli). Received a Mom It Forward mom award and made me nearly break down in front of a room of 50+ women as I handed it to you (Dwan). Served with me at the Nashville Rescue Mission (Josh and Rebecca Unfried, Ghennipher Weeks, Marie LeBaron, Kim, Carissa Rogers). Helped get us sponsorship and/or donations for the Mom It Forward girl's night out after party and Nashville Rescue Mission service project (Nancy Martira and Krista Parry). Sponsored or donated to the above-mentioned events (Scanpan and Park City Mountain Resort). Attended the Mom It Forward girl's night out after party for 3 hours after putting on an amazing conference and being extremely exhausted (Barbara Jones). Sat next to me on the plane during the flight out (Marie LeBaron). Chatted with me in the Food Court while we waited to board our flights back (Roni). Shared with me your career and life goals (Chris Mann). Took amazing pictures of the entire event (Secret Agent Momma). Played board games with me during Mama Mia (all 10 of you... yes! you, Lucretia). Danced with me after Mama Mia (all of you know who you are, especially you Danielle, AKA Miss Bunny/Kitty Slippers!). Socialized and shared/brainstormed social media strategies with me one on one—sometimes over chopping vegetables (John Andrews, Barbara Jones, Josh Unfried). Brought out the real tears by allowing me to participate in a humbling, awesome, rewarding service project (Nashville Rescue Mission). Made me feel included and loved (Colleen). Made me realize I am far too conservative in my shoe selection and caused me to seriously break the "thou shalt not covet thy neighbor's shoes" commandment—not to mention being incredibly nice (Rachel). Got me to ALMOST love country music after watching you karaoke it up in the Pink Slip Lounge (Casey). Were an instrumental part in getting said party planned, especially in lining up all the wonderful prizes (Jerri Ann). Hung out with us during our extended stay post Blissdom (Michelle, Roni, Colleen). Helped me get a better grasp of PR (I want to link to the entire panel??? what an amazing, influential group you were). Made me want to lick your baby's face (Alli). Always had a smile for me (Amy). Were amazingly accommodating: Brought me room service at 2:30 a.m. when it had closed hours before, shuttled us to the dollar store and waited patiently for us for 25 minutes, prepared the party room to our precise requests and expectations, and simply went above and beyond in every way (The Hotel Preston). Wow! I seriously could go on and on! Wait! I just did. LOL! Thanks to all of you, mentioned or not, for making this a wonderful weekend for me. You made a meaningful difference in my life! I loved the board game too but I do think there was some sneaking going on the other side....kidding. Great to meet you and can't wait for another GNO! what a lovely surprise to see you back at your own blog, little lady! sounds like you gals had a blast. when i finally got around to seriously consider going, too much had been scheduled around here. hope MIF will be popping up at another conference, because i am definitely going to hit one (at some point!). love your list post! It was amazing, I won one of the lisa leonard necklaces at your party. I loooooove it and have worn it every day so far. What an awesome recap! And I'm so honored to be included in the link fest..
Great recap & I adore the photo of Alli and Barb! Wow - great recap! I just wish we had about 2 more days to do everything!!! And, I did genuinely want to meet you and Carissa! 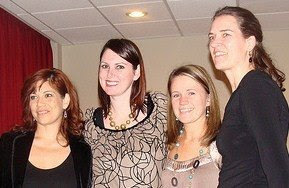 You are doing amazing things w/ #GNO and I just look forward to the parties!!! I would love to learn all that about my peeps..blogging is a whole community and a big loveable one at that! I may just sign up next time because of your shared thoughts! Hi, Jyl, thanks for stopping by! I don't think we got to meet at Blissdom, but I really wish I had been able to meet more of you. You sound like you had a LOT of fun. I hung with my new girls & didn't get out & mingle as much as i should have. Look forward to getting to know you too! Being part of a live GNO can not even compare to twitter. I just LOVED meeting you IRL. I can't wait for the next opportunity! Wow, you must have spent a long time writing this post. Linking had to take forever! But I expect nothing less from you my friend. It was totally a pleasure to meet you in real life. 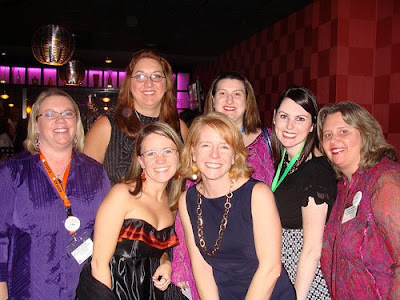 I can't wait to do it again - BlogHer in July? HAHAHAHA...thou shall not covent shoes....so we know that's an inside joke, but soo funny...maybe I'll blog about your shoes...lol. What a great post! I was all in the mushy mood and I got to the shoes, and I still can't stop laughing. Just know...I love you girlfriend, You Rock!!! Well, we kind of played board games. We tried at least! It was so great meeting you and spending some time with you, even though that time was too short! FAbulous list! Y'all are so amazing and I feel truly honored to be included, girl, you could borrow these shoes any day!!! Sounds like such a good time, and the photos of you and Carissa are great! Wow! Blissdom sounds like it was amazing and I am totally hoping to attend next year! And by the way, you look GORGEOUS in the photos lady! It was truly an honor to meet you and thanks for everything-the advice, the company and your patience with my venting lol! Can't wait to see you again! It sounds like this was a wonderful conference. You are doing such great things with Mom It Forward!